Professor Marina Warner from the School of Arts explains how she decided on her list of influential women writers for BBC Radio 4 Today programme, ahead of the upcoming celebrations of the centenary of the women’s vote. A text message arrived recently from the Today programme on BBC Radio 4, saying they were celebrating the 100 years since the vote was given women in 2018 and they wanted 100 names of influential women; would I come on and nominate writers? Later, in a phone call, the brief was clarified: would I pick six British women writers, and plump for one favourite? I struggled, I struggled, I made lists, long lists. Literature is such a vast field and women have excelled in it. Professions which require official qualifications often excluded women, but writing takes place in private. Indeed, the step into publication led the Brontes and George Eliot and Katherine Bradley and Edith Cooper (‘Michael Field’), to adopt male pseudonyms, while today, the use of initials still works to neutralise female names: P.D James, A.S Byatt, J.K Rowling. For the rest of the week, the categories featured in the programme were the arts and architecture, politics, science, sport, and engineering. For historical reasons, the possibilities in those spheres of activity are far smaller than in literature and lots of living heroines were chosen, some very moot in my view. Samira Shackle, who is the deputy editor of the New Humanist, was on the programme with me to choose journalists and the centenary also led me to think of women whose writing engaged with the world, who campaigned and argued and spoke out, often risking unpopularity and even obloquy. I tossed and turn the night before I was due to go live on the programme, desperately trying to arrive at a shortlist. I came up with seven names – the bold names in this list are ones I mentioned in the programme, and the italics are the ones I would have liked to include. 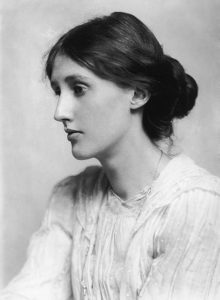 In the end, I placed Virginia Woolf (pictured, left) first – it felt impossible not to. She combines both activism and lyricism; her forthright attacks on inequality and on militarism made her the obvious first choice. But I tied Woolf (against the rules) with Angela Carter, because Angela Carter wove her social dreaming and ferocious critique into her fiction; she was also the most acute, acerbic observer and polemicist in her many essays. You may not agree with her about the Marquis de Sade but she makes you think, and nearly 40 years later, her arguments grapple with the issues so very alive now – desire, collusion, subjugation. Samira and I didn’t get time to go through our full lists (before our slot, John Humphrys was interviewing Nigel Farage and ate into our time, as Mishal Hussein, our interviewer, noticed with growing anxiety). Samira nominated Clare Hollingworth, the war correspondent as her number one, and Claudia Jones, the founder of the Notting Hill Carnival and of the first black British newspaper as one of her six. I brought in Rebecca West, who took her nom de plume – her nom de guerre – from an Ibsen heroine who defies all social expectations, wrote uncompromising, diamond-sharp accounts of the Nuremberg trials and other criminal cases and was always outspoken and combative – incurring a lot of hostility at every stage of her long life. Sarah Kane seemed to me a crucial figure in the history of women writers who are now writing so powerfully for the theatre, while Sylvia Plath spoke to my generation (Ariel came out when I was a student) in fiery tongues. Plath was, of course, American by birth and her case raised an issue we had no time to address: she lived and wrote in England, she profoundly shaped the voice of poetry in this country (possibly more than in her own). Likewise, I wanted to include Elizabeth Bowen (Anglo-Irish). Then there are the writers who were born in the time of the British empire – is Jean Rhys Dominican, or can she be included in British writers? She is certainly a key figure in English Literature. What about Doris Lessing? Katherine Mansfield? Even Isak Dinesen (Karen Blixen) seems to be another key figure in English Literature; though she was Danish by birth and lived in Kenya, she wrote her greatest stories in English. We had no time to attack this deeply difficult question. Literature has no borders and the peculiar status of English makes writing in English a wide horizon, leaping over the walls and fences of national Britishness. The rest of my six are Muriel Spark, whose centenary it is this year: her imagination is streaked with off-kilter fantasy and weirdness, and I wanted very much to pay tribute to this magnificent tradition in our literature, to writers who dream up alternative worlds, working in genres that fall under Fantasy, Children’s Literature and Science Fiction. I couldn’t bring in Ursula Le Guin as she is definitely American. Diana Wynne-Jones was on my early lists, but I decided to pay tribute to Lynne Reid-Banks, who is still alive, aged 88, because she combines both social realism and utopianism. The L-Shaped Room (1960) is a pioneering novel about a young, single woman thrown out by her family because she is having a baby. Restrained in tone, it is nevertheless a devastating picture of the conventions, prejudice, squalor, and callousness that pervaded this country not that long ago (and gives a clear warning); but Lynne Reid-Banks also wrote the series of fables, beginning with The Indian in the Cupboard. Criticised by some for their depiction of Native Americans, the stories are terrific utopian adventures, exploring the power of imagination to nurture humanity and courage and they belong in the stream of lively inventive writing to which J.K Rowling and Philip Pullman belong. There were so many colossuses I wanted to mention – Iris Murdoch, Stevie Smith. Not to speak of the living – who, out of a kind of tact, I did not want to introduce. But there was one other genre I would have liked to recognise: graphic novels. In this area, Posy Simmonds reigns supreme: innovatory, trenchant, a brilliant storyteller and observer of the human comedy, gifted with an unrivaled ear for contemporary speech. She would make a splendid nominee, but I’ve run way over the limit of six. On Tuesday 6 February in Westminster Hall in London, the nominations will be debated in front of a live audience and the overall winner chosen. Please keep an eye on the website and see if you can take part – and support artists and writers as the key figures in women’s lives and opportunities over the last 100 years. You can listen to Professor Marina Warner feature on the BBC Radio 4 Today programme (from 2:20:40 onwards). Abigail Bryant, recent graduate in Arts and Humanities, gives her advice on coming back to university after a hiatus from education, and how to juggle work and study. Before starting at Birkbeck, I worried that the years I’d had out of education may make it difficult to slot back into it seamlessly and that my ‘academic brain’ just wasn’t there anymore. I hadn’t written an essay for over five years! It turned out that I had absolutely no reason to feel like this. As soon as you start you’re given an encouraging, safe space to learn about the technical stuff such as referencing and essay structure, as well as logistics about how the university works and where you can find the resources that you’re entitled to. There are also plenty of opportunities to ask questions, so you’ll quickly realise that you’re not on your own – there is support everywhere you turn! If, like me, you’ll be working and studying simultaneously, good for you! You’re in for an enriching, challenging but ultimately rewarding experience. For me, the main goal was always to enjoy my course and never to view it as a chore, and luckily I managed to maintain this for the four years that I was at Birkbeck. Of course, after a long and tough week at work, the idea of sitting and working on an assignment at the weekend was not always a barrel of laughs, but I made sure that I chose modules that I felt passionately about and essay questions that I could get my teeth into, and would involve research that I was genuinely interested in. The feeling of satisfaction and pride upon handing in an assignment would always outweigh the pain of getting it finished! It is important to make time for yourself as well, and make sure that alongside work and study, you have the headspace to pursue interests and ‘me time’. This will no doubt benefit all aspects of your life, and your overall happiness should take priority and feed into your course at Birkbeck! At Birkbeck, you are so lucky to have access to a wealth of research materials, acclaimed professors, and diverse module choices. For maximum fulfilment and enjoyment, stay open minded and have a keen willingness to constantly learn and improve, both from your teaching materials and your peers. Embrace the resources available to you, and immerse yourself in Bloomsbury – there’s so much fascinating history within the walls that you’re learning in! Keep up to date with events going on – I’ve attended many panel discussions, career events and summer workshops throughout my time at Birkbeck. They are all free to attend and are a great way to network with students, teachers and industry folk alike (as well as boost your learning). Most importantly, challenge yourself – never feel like something’s not worth exploring because you don’t initially understand it. Ask questions, do some independent research, and you’ll be amazed at what you can discover and achieve. For all the benefits of evening study, there are inevitable challenges to balancing university with other components of your life. Stay organised, disciplined and committed to your studies. The better you manage your time, the more fun your course will be, and the more you will get out of it. Studying should never feel like a chore, but an accomplishment worth fighting for. Lastly, try not to compare yourself to other students in terms of ability or knowledge. You have a unique and valuable perspective to bring to the classroom, so never feel afraid to express your opinion or thoughts in seminars. Birkbeck is a safe space to develop and articulate ideas and arguments, with infinite room for progression and improvement. Follow your instincts, pursue your passions, learn from and with others, and always value your own voice. Whatever you’re studying, and whatever your stage of life, Birkbeck is a life-changing, diverse, and extremely exciting place to study. It’s easily one of the best things I ever did, and I’d implore anyone to embrace every second, every resource and every opportunity it has to offer. 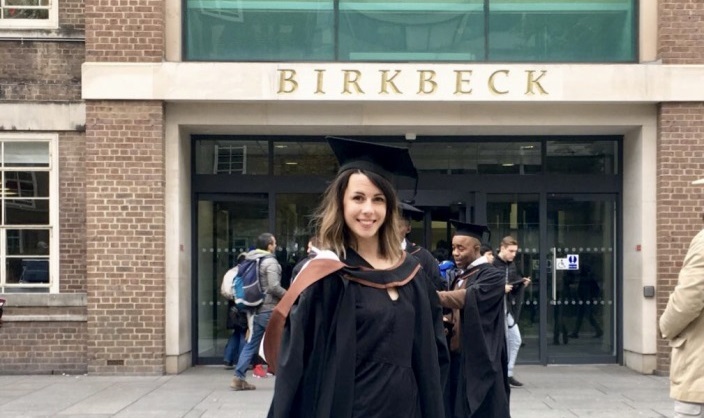 When Alison Hitchcock decided to write a letter to a friend after he was diagnosed with cancer, she had no idea it would lead to a new venture and an MA in Creative Writing at Birkbeck. She writes about how these letters changed her life. 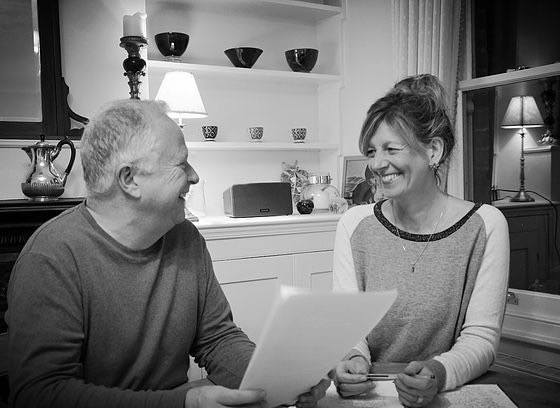 Back in 2010, I would never have predicted that when my friend, Brian Greenley, was diagnosed with bowel cancer, the letters that I offered to write to him would change both our lives. In 2009 Brian and I had met on a yoga holiday in India. We got on well, both equally inflexible and neither of us able to do a headstand, but we had little else in common. I was a City career-girl, and Brian had recently taken voluntary redundancy and was thinking of setting up his own gardening business. We met up a couple of times back in the UK, but neither of us would have described ourselves as anything other than acquaintances. When Brian shared that he had been diagnosed with cancer, perhaps because I didn’t know what to say, I offered to write letters to cheer him up. Looking back, I’m not sure what possessed me – I was no writer. But a promise was a promise! The letters began and over the next two years, as Brian’s cancer developed to stage four, I kept on writing. I surprised myself, finding that I cherished the time I sat alone and wrote. It felt good to be doing something for someone else and it removed the feeling of helplessness that friends so often feel when a loved one becomes ill.
Enthused by my newly discovered passion for writing, I attended an Arvon Starting To Write course and began to understand what it means to want to write. From then on, as for so many who attend Arvon, everything changed. I wanted to write more and learn more. My letters continued but Arvon had given me an appetite for writing and letters were no longer enough, so I applied to Birkbeck’s Creative Writing MA. The MA not only confirmed my love of the writing process, it gave me confidence to explore different styles. By the time the course ended, I had had short stories published, written a novel and become involved with wonderful literary organisations such as Word Factory. At the end of 2016, Brian and I were recorded for Radio 4’s The Listening Project. Such was the response to our story, we set up From Me to You, a charity which inspires people to write letters to friends with cancer; keeping them connected at a time when they feel most disconnected. At From Me to You we run letter writing workshops, speak at events and our website hosts writing tips on what to say and how to say it, and shares many inspirational stories from those who have received and sent letters. Recently we have expanded the initiative so that people can write letters to cancer patients they have never met. The communications range from postcards and notes that say something as simple as ‘keep strong’ to longer letters recounting tales of everyday life. These letters are acts of pure kindness. There is no obligation on the recipient to write back. Brian never responded to any one of my 100 letters and I never expected him to. 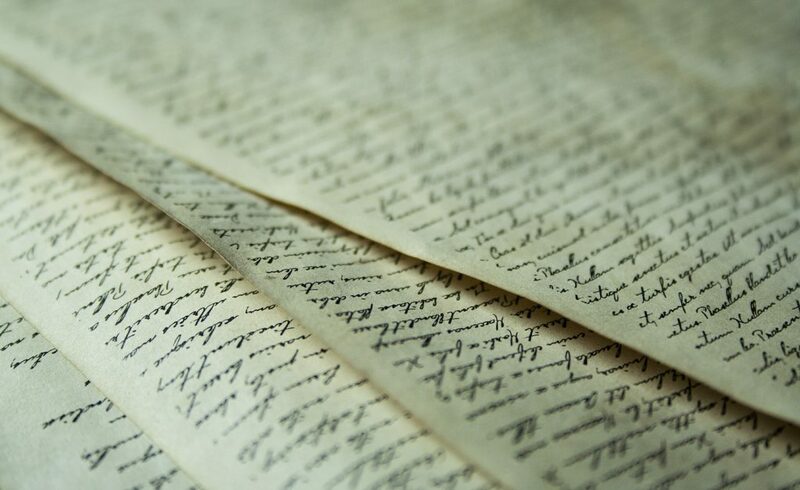 The letters had given me the gift of writing and a whole new life. That alone was, and still is, more than enough.